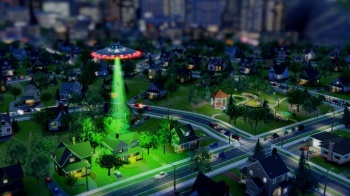 Electronic Arts has taken the SimCity servers offline in order to roll out the long-awaited offline mode update. You asked for it, and now, after a year of excuses, obfuscation and plain old dicking around, it's finally here: Electronic Arts announced that the "impossible" offline mode for SimCity - and yes, I'm still banging that drum - will roll out today. "Today at 6am PDT [9am EDT] we will be releasing Update 10 with Offline play." Maxis wrote on the EA forums. "This involves server down time and the game servers will be unavailable for a few hours." It's an awfully mundane message for what is a pretty big deal as these things go. SimCity launched in March of 2013 to no end of technical trouble, largely due to problems with the remote servers, leaving the game in a virtually unplayable state for many players. In response to demands that the always-on requirement be eliminated, Maxis and EA insisted that the game relied on remote connections for much of its "under-the-hood" work and said it wouldn't be possible to make it offline without dramatically re-engineering it, points that were quickly proven somewhat exaggerated by individual modders who were able to get the game running offline, with some limitations, in very short order. It's an embarrassing climbdown for EA, but also long overdue - quite possibly to the point that it no longer matters anyway. Maybe this will make the prospect of picking SimCity out of the bargain bin a little more attractive, but will it serve to salvage the game, or EA's reputation? That I very much doubt.